Rachel Carson, Monarch butterflies, milkweed plants, Maine, Maryland, as well as the people of US, Canada and Mexico are connected in a special way this year. In the months before Rachel Carson’s passing on April 14, 1964, Monarch butterflies were a source of inspiration to her as they migrated past Newagen Point, near her home in Maine. It was late summer and Monarchs were moving down the east coast from Canada toward Mexico and their winter roost. Rachel wrote a famous letter about seeing them–“But most of all I shall remember the Monarchs…” (Lear, L., Rachel Carson Witness for Nature, Holt, 1997). In Maryland some years later during a similar migration Monarchs completely covered small shrubs (marsh elders) growing on the Chesapeake Bay shore, where they rested overnight. This sight inspired Maryland’s naturalist author Tom Horton to write about seeing them there in “The Miracle Bush.” (Harp & Horton, The Great Marsh, 2002, JHU Press) The Monarch migration along the east coast from Canada to Mexico is considered one of the world’s natural wonders. 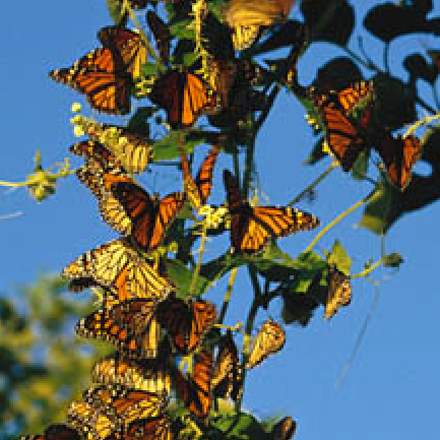 Many people visit the Mexican forest where the butterflies overwinter for the thrill of being among them. Fewer Monarchs are migrating from Canada through Maryland to Mexico now and their population is in serious decline. Why are there fewer east coast Monarchs? One reason is the lack of milkweed plants. Monarchs cannot reproduce without milkweed. Monarch caterpillars are unique among butterflies in needing milkweed leaves to grow into adults. Female Monarch butterflies deposit their eggs on milkweed leaves so that developing caterpillars can feed on the leaves. Milkweed blossoms provide nectar and pollen for adult Monarchs as well as for other native wild pollinators (various native bee and butterfly species). Why are milkweed plants disappearing? They have been eradicated from around conventional farm fields, from along roadsides and at other sites by the spraying of chemical herbicides including the heavily promoted and widely applied, broad spectrum product, Roundup™ (active ingredient glyphosate). Rachel Carson knew that chemical herbicides could wipe out plants that animals and humans depend on. In her book Silent Spring she called the earth’s vegetation a “green mantle” and warned that when we disturb plant communities with chemical herbicides “what we do may have consequences remote in time and space.” So for the sake of Monarchs, other wildlife and to help preserve natural ecosystems chemical pesticides need to be avoided whenever possible. All over the US on April 14, 2014, fifty years to the day after Rachel Carson’s death, people focused their attention on her legacy and on Monarch butterflies, the iconic insects that migrate through three countries (US, Mexico and Canada) twice a year. During the designated time, starting with sunset on April 13th and continuing until sunset April 14th, people pledged to create habitats for butterflies that include milkweed plants. These sites will be in their own gardens in schools, churches, synagogues, temples and places of business as well. Beyond their importance for Monarchs, milkweeds are valuable where deer abound. Deer avoid eating milkweed leaves (due to a harmful component in the leaves). However, as many gardeners know, deer can and frequently do browse on goldenrod, asters, mums and other flowering plants that serve as sources of pollen and nectar in fields, forests and residential gardens, thus depriving wild pollinators of essential nourishment. So, cultivating milkweed plants in natural areas as well as in home gardens should be practiced by nature lovers everywhere. So for various reasons including: sustaining a forest in Mexico, supporting rural Mexican residents, creating chemical-free habitats for beneficial insects in Maryland and beyond, preserving the Monarch migration as a source of wonder for the present generation and those to come, as well as raising awareness of Rachel Carson’s legacy, planting milkweed and avoiding pesticide applications are important steps that everyone can take. I pledge to make a place for butterflies on my property through providing plants for their various life forms and to include milkweed in the plantings. I pledge to speak with friends and associates about making a place for Monarchs and other butterflies in their gardens. I further pledge not to use chemical pesticides such as the herbicide,Roundup™ and any neonicotinoid insecticides in these and other areas visited by wildlife (such as butterflies, pollinators, beneficial insects, frogs, and birds). Since climate change and extreme weather are also potential threats to the monarchs in Mexico, I will work to reduce generation of greenhouse gases. Residents of US, Canada and Mexico have reasons to help protect Monarch butterflies. We hope their faith based communities and governments will support and encourage their efforts.